The following notes were taken, with kind permission, from Hilary Peel’s book Salen Church – A History, 2001. Many Thanks. Salen Church is situated in the centre of the village on the junction of the Gruline road with the main Craignure to Tobermory road. 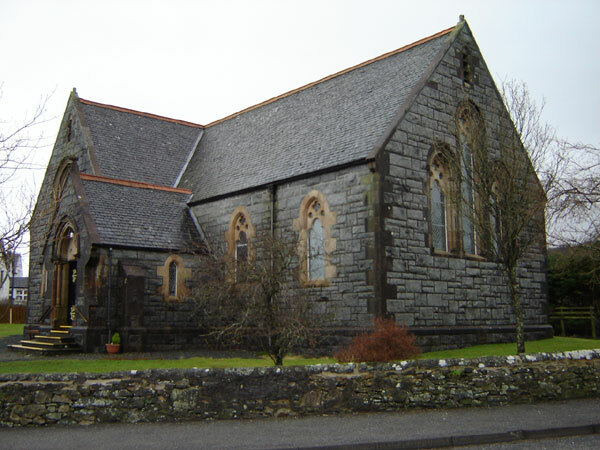 The first church was built in Salen (often called Salinicolmukill) in 1777 following the Reformation and, at the same time, churches were built at Kinlochspelve and Craignure. However, by 1822 the church at Salen was almost in ruins. 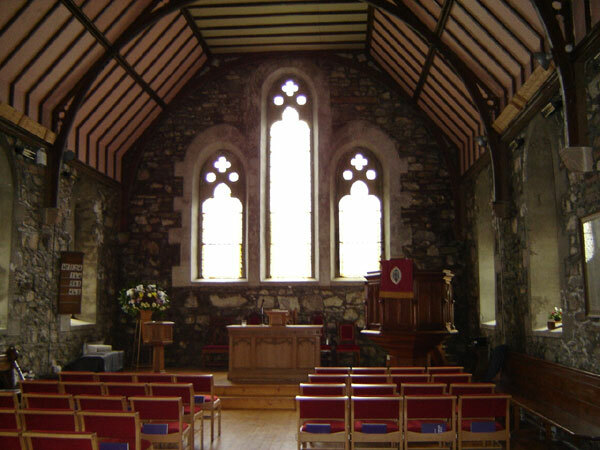 Then, in 1824, when applications were invited by the Commissioners of the General Assembly of the Church of Scotland to build new Parliamentary churches throughout Scotland, the heritors (landowners) applied for a new church in Salen. Despite its ruinous state, the Commissioners finally agreed to fund a manse (completed in 1827), establish a minister at Salen and contribute £150 towards ‘the refitting and enlarging’ of the existing church. The heritors were responsible for providing sufficient funds for future repairs. There is little evidence as to how the church was enlarged. It is believed to have been similar to Telford’s Parliamentary church design, being rectangular with a short aisle in the centre of one of the longer walls. In the long front wall were two doors and, at one end, a small session house. A pulpit, with a precentor’s desk below it, was probably placed between the two doors. There would have been a long communion table in front of the pulpit, with elders’ seats on each side facing the rest of the congregation, and two galleries upstairs, probably reached by internal staircases. The building would have accommodated at least 300 people and served Salen for 70 years. By 1890 the church was in need of repair. The floor consisted of rough, uneven stone in the main area and mainly of earth between the pews. All the doors were rotting. The seating was uncomfortable and narrow, there was a lack of heating and body odours were unbearable at times with so many people sitting squashed together. However, it was to be several years later that, through the efforts of the incumbent at that time, Rev. Colin MacCallum, the presbytery agreed to build a new church. Final plans were drawn up during mid 1897 and the new church was opened on 9th July 1899 by the Rev. Dr Norman Macleod from Inverness, a member of the Macleods of Morvern. The church was full in spite of it being a stormy day, and Rev. Macleod preached a ‘weighty and impressive’ sermon on Luke 9: 28-29 at both the English and Gaelic services . The building is mid-Gothic in style with a cruciform plan of chancel and nave, together with north and south transepts. The external walls are of coursed, Ardshiel, bullfaced granite and freestone facings. The pulpit was sited in the centre of the chancel and, at the time, caused Rev. Dr Macleod to comment on there being room for improvement to the internal structure. To see such a lovely building from the outside and then to go in and ‘find a very noticeable pulpit placed in the very centre of the chancel’ was a great disappointment, as he felt it should have been in its ‘proper’ place to one side or the other as was originally planned. This comment was taken up for several weeks in letters to the Oban Times, but the pulpit remained in this position for 60 years. The harmonium was in the north-eastern corner, and near by was a curtained-off area that was used as the vestry and could be entered from an outside door. This door was eventually filled in to match the surrounding stonework in 1962. The present ‘harmonium’ – a Technics Digital Piano – was purchased in 1999. The wall around the church was completed sometime in 1908 or early 1909 through the efforts of the Rev. Colin MacCallum, who requested an enclosing wall ‘of sufficient height and stability’ in order ‘to protect the church from the encroachment of people and animals’. The church seated 260 people and cost £1,300 to build, which was more than the original estimate. Although the new church was a great improvement on the old one, it came with new responsibilities and worries, not least of which was a debt that would remain until as late as 1905. In 1933 a vestry – known as The Guild Room – was added to the church, as was heating. The funding for this was raised through the efforts of the Woman’s Guild. Electricity was finally installed in 1958 and in 1959 the pulpit was moved to the side, towards the south transept, remaining there for a further 33 years. Following years of trying to keep up with the repairs on the church, in March 1991 it was completely restored and converted into a building that could be used in many different ways, as well as for worship. Restoration was completed in November 1992. 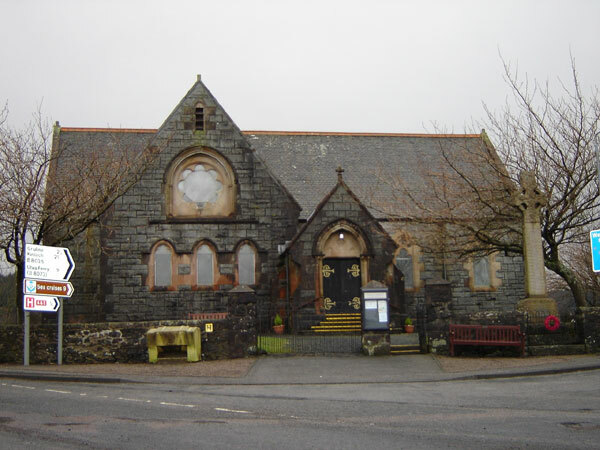 Early in the 21st century, a new church hall was built behind the church, comprising a new vestry/office, two meeting rooms, a kitchen and server, and toilet accommodation. Besides facilitating religious services, these facilities are used by many local groups. 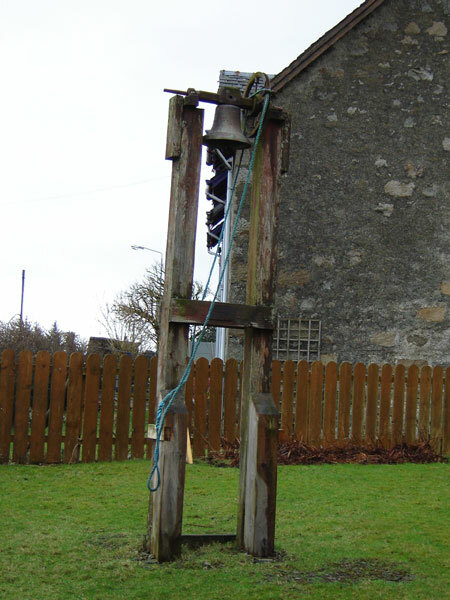 The church bell hangs on a wooden construction in the churchyard away from the church. On the bell is an inscription ‘The Gift of Richard Alsager Esq. of Upper Tooting, Surry to the Parish of Salen in return for Mull hospitality A.D. 1834’. Although Richard Alsager had met Lachlan Macquarie many years before, it is not known why he came to Mull in 1834 and why hospitality on the island had caused him to donate a bell to Salen church. The lore of St Columba is still preserved in Mull and behind what was the Craig Hotel, now known as The Craig, is a rocky bluff, from which it is believed St Columba gave a sermon that was ‘not very well attended’. Nearby is a small burn called The Burn of the Sermons. Further up the bluff there are traces of a chapel thought to have been abandoned due to the impurity of the water. See Macnab, P, Mull and Iona Highways & Byways, 1999.